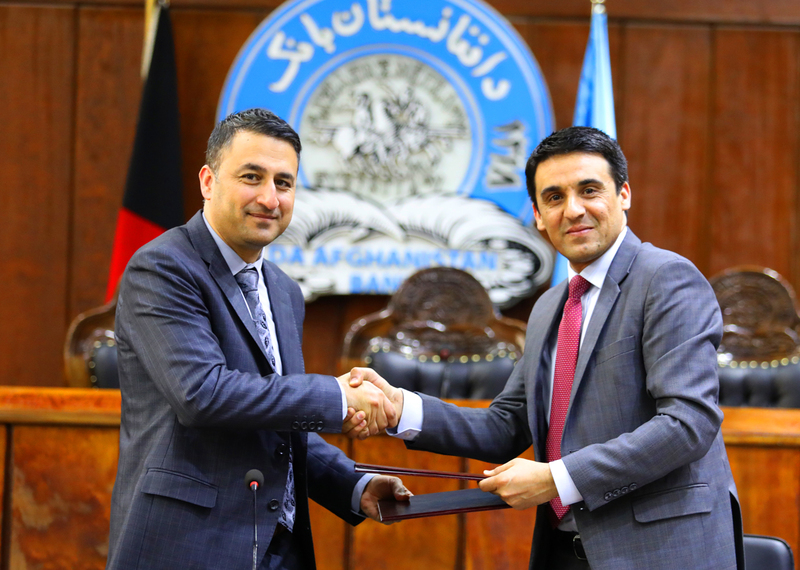 Da Afghanistan Bank’s Financial Intelligence Unit (FinTRACA) and National Directorate of Security (NDS) signed Memorandum of Understanding (MOU) on the 13th of April, 2019, purposed to facilitate information exchange between the two organizations to combat terrorist financing, money laundering and other predicate offences. The MOU was signed by DAB First Deputy H.E Mr. Wahidullah Nawsher and Deputy Chief of Operations of NDS Mr. Ahmad Zia Saraj in presence of Director General of FinTRACA Mr. Nesar Yousufzai. The signing event of the MOU, which took place in Da Afghanistan Bank’s conference Hall, was attended by high level delegations from DAB and NDS respectively. FinTRACA has been exchanging information with a number of enforcement bodies operating within the NDS since its establishment. Due to the amendments in the AML/CFT legislations, risk and context of the country, and in order to provide value-added operational and strategic analytical products, and to support the criminal justice system; FinTRACA has initiated this process to expand the scope of its cooperation and coordination with NDS. Deputy Chief of Operations of the NDS displayed contentment over signing the MOU and stressed upon its importance. He assured the financial intelligence Unit of DAB of full cooperation by NDS in practical implementation of the MOU. Director General of FinTRACA also welcomed the NDS delegations and thanked the delegation for attending the MOU signing event. He shed light upon the importance of the MOU in the context of aligning national cooperation with FATF recommendations and utilizing the MOU to combat all forms of financial crimes in cooperation with the NDS. He emphasized on the fact that this MOU is aimed at leveraging analytic products with ground operations and doing so, would significantly impact the results obtained from cooperation between NDS and DAB by increasing effective outcomes. FinTRACA and the relevant bodies within NDS desire in a spirit of cooperation and mutual interest within the framework of AML/CFT to facilitate the exchange of information in support of financial investigations related to money laundering, terrorist financing and other associated crimes. To that end, the Authorities have reached the understanding to foster the said information exchange to the fullest possible extent. This MOU enables FinTRACA to gather case-sensitive information from the relevant law enforcement bodies operating within NDS and will significantly impact the process of detection, investigation, as well as prosecution of financial crimes. As a part of its commitment, FinTRACA will continues to assist the relevant bodies within NDS by providing technical assistance and coaching support in order to achieve the desired outcomes in accordance with the provisions of AML/CFT laws of the country.